Ben Skowronek celebrates a touchdown. The sophomore receiver collected seven catches for 117 yards against Purdue. In a game that started as a defensive slugfest, Northwestern needed an offensive spark Saturday. The Wildcats combined with visiting Purdue to come up empty on the game’s first nine drives. 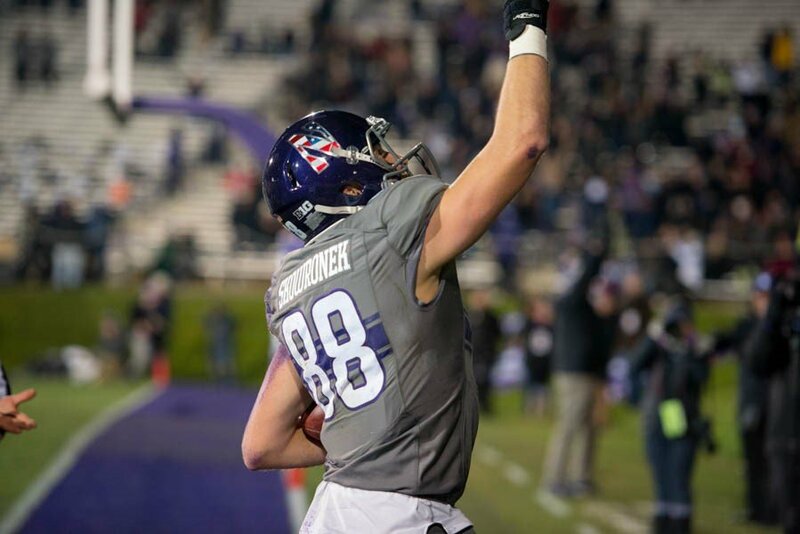 On a frosty evening at Ryan Field, sophomore receiver Ben Skowronek helped break the ice. Skowronek pulled in a 19-yard catch to open the contest’s 10th possession, launching NU into Purdue territory on a drive that ended in a touchdown run for junior quarterback Clayton Thorson. The 6-foot-4 receiver kept it going from there, finishing the night with seven catches for 117 yards in a 23-13 win for the No. 25 Cats (7-3, 5-2 Big Ten). Both totals represented his career bests in Big Ten play. Skowronek continued to find holes in the Boilermakers’ (4-6, 2-5) defense on NU’s second scoring drive as the Cats marched 96 yards in the closing minutes of the first half. First, he snagged a 27-yard catch to move NU out of the shadow of its own end zone. Moments later, Thorson lobbed the ball to Skowronek in the back corner of the end zone, and the sophomore pulled down the catch for an 11-yard touchdown. The reception gave the Cats a two-score advantage going into the break. And the 14-0 lead allowed NU to control the second half of its fifth straight win. Thorson continued to target Skowronek after halftime, and the sophomore nabbed a 25-yard reception in the final frame. Along the way, the wideout continued to cement his status as Thorson’s go-to receiver when the team needs a chunk of yardage. The sophomore entered the day as NU’s leader in receiving yards, and he finished it having cleared the 100-yard mark for the second time this season. Thorson said after the game that Skowronek’s hard work throughout the fall is paying off.